In 1965, the 50th anniversary of the genocide, a 24-hour mass protest was initiated in Yerevan demanding recognition of the Armenian Genocide by Soviet authorities. 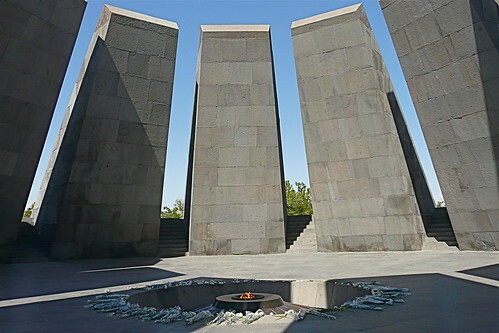 The memorial was completed two years later, at Tsitsernakaberd above the Hrazdan gorge in Yerevan. The 44 metres (140 ft) stele symbolizes the national rebirth of Armenians. Twelve slabs are positioned in a circle, representing 12 lost provinces in present day Turkey. At the center of the circle there is an eternal flame. Each April 24, hundreds of thousands of people walk to the genocide monument and lay flowers around the eternal flame.